What is a “Lotion Bar” you may ask? Well it is something that resembles a bar of soap but is actually lotion. You rub it on your hands, feet or other parts of your body to help with dry, chapped or cracked skin. I find I greatly prefer it to a liquid lotion and since I make it myself I know what is in it. And while it might not taste the best, everything I used you can eat. 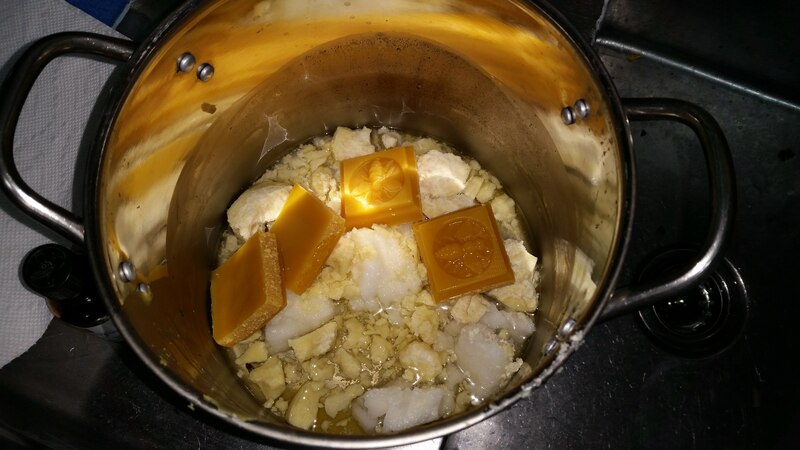 I use a 4 equal part (by weight) recipe of an oil (I prefer almond), a soft fat/butter (Shea butter or coconut oil) a harder fat/butter (coco butter) and finally beeswax. It is my belief that the oils & fats moisturizes your skin and the wax forms a protective coating on top of your skin. While I haven’t tried to prove this, it works for me so that is all that counts. I make it 1 lb at a time by using a digital scale and a small stainless steel stock pot. First a word of warning, do not expect to be able to use the pot again for cooking without a considerable amount of effort cleaning it. You are better off getting a set of cheep ones for this type of activity. I got a set of 4 from Harbor Freight for about $20 and I can use them as a double boiler if I need to. 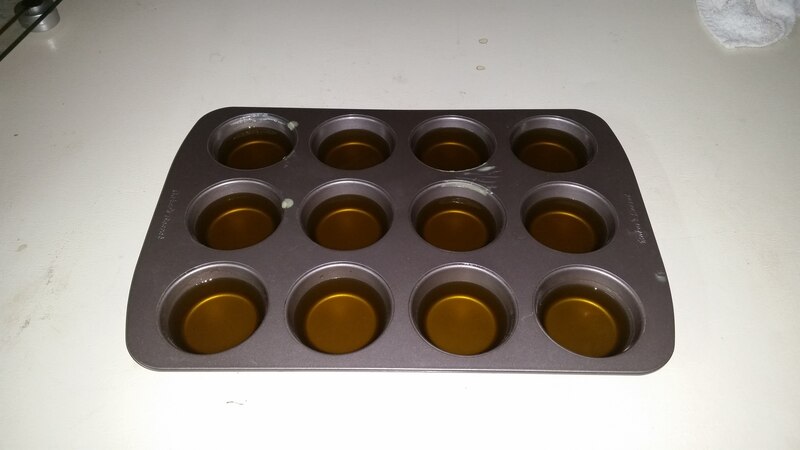 You need 4 oz of each ingredient, in this case I used beeswax from a local beekeeper, coconut oil from Costco and almond oil and coco butter from TheSage.com which also has a bunch of container choices as well as stuff for making soap. It looks like a real mess when you dump all the ingredients together cold, but when you melt them together you get a beautiful golden liquid. 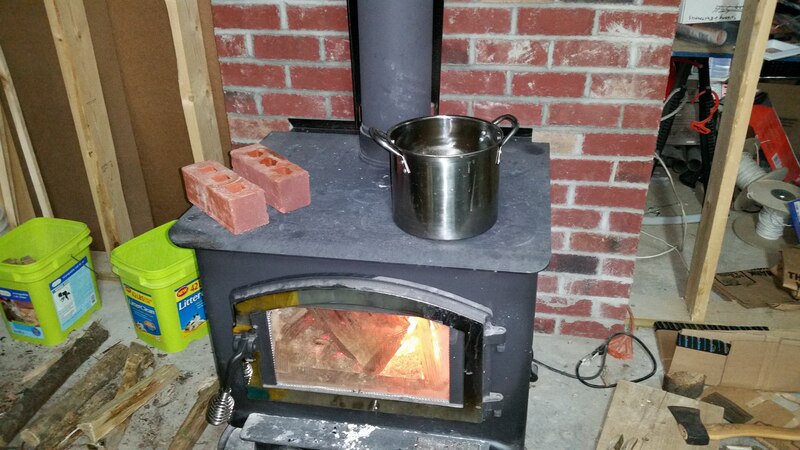 In the winter time I’ve taken to melting this kind of project on my wood stove. 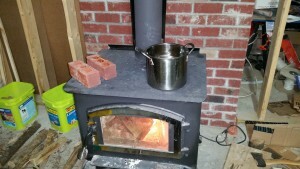 If I need really gentle heat I set the stock pot on top of two bricks, otherwise the front corner is the coolest and closer to the chimney is hotter. In this example the almond oil was already a liquid and the coconut oil melted first as it has the lowest melt point of the solids. 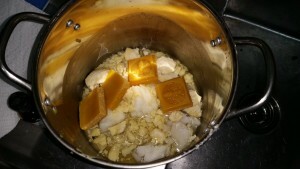 The coco butter melted next and several minutes later the beeswax. Swirling it around makes sure everything is well combined and the resulting melting point will be high enough to not melt in the summer. I use a muffin tin as my mold because that is what I had. Dividing up the 1 lb of material results in 12 pucks of 1-1/3 oz each. Notice the golden-yellow color when it is a liquid. It takes a fair bit of time to solidify because you had to get it hot enough for the beeswax to melt. Resist the urge to pop it in the freezer as you will have big cracks in your finished product. It still works just fine but doesn’t look as nice. Once it has solidified you can put it in the freezer to make it easier to get out. 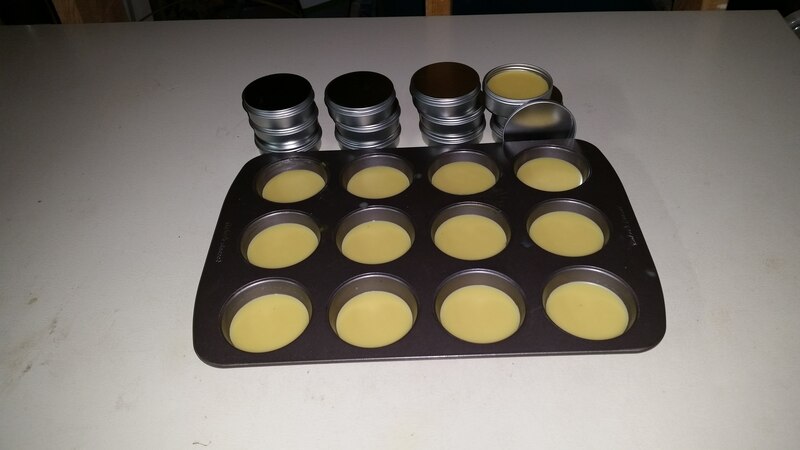 I found that a 2 oz screw top tin holds one of these 1-1/3 oz to 1-1/2 oz lotion bars and protects it from getting gunky and makes them easy to travel or give away. I’ve got them from TheSage.com in the past as their price looks to be better than Amazon, but only if you are ordering more stuff otherwise the shipping will get you. The cost to make these is probably a bit more than $1 each, close to $2 with the tin. However they last a long time and rubbing it on your hands every night before going to bed will keep them from cracking in the winter months. I like them without any added scent, but you can easily add some essential oils if the subtle honey-cherry-chocolate smell isn’t to your liking. Further they can always be melted and re-cast into another shape or scent oil added later. I also got a soap mold from a craft store that has something like a 4 oz bar if you want a bigger piece for yourself at home.